Today we would follow the Ruta del Desierto, the Circuito del Costera or ‘Coast Road’. SatNav seemed to know of its existence, in patches, but seemed to assume that it was still in the state in which I had found it in 2001, a warren of often poorly maintained ripio tracks, especially, at the time, the Carrizal Bajo to Totoral stretch. These days this endurance track had been replaced by a good oil/salt road, smoother than many UK roads. Although a maximum speed of 40 km.p.hr. was recommended, and assumed by SatNav, cruising at 100 km.p.hr. we were regularly overtaken by cars and trucks in a greater hurry. In 2004 we were treated to the northern stretch of this track in full flower. 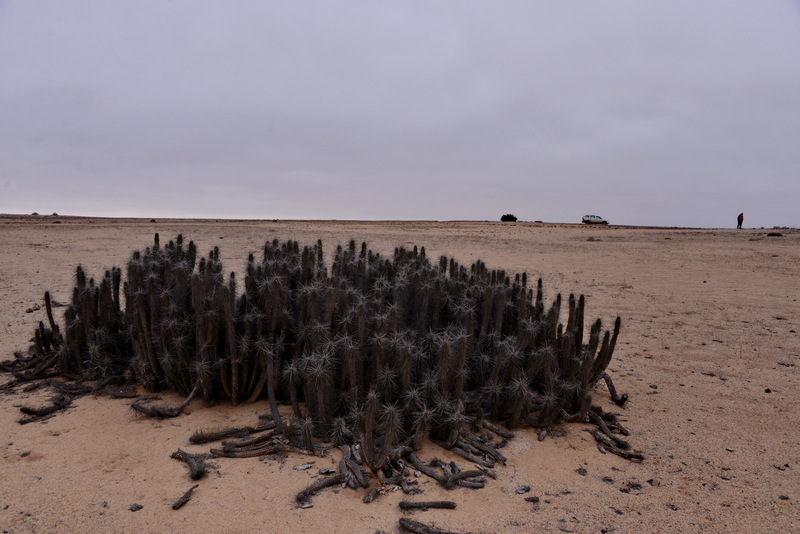 Today’s images clearly show the quite different and ‘normal’ state of the desert: barren, with minimal signs of life. Despite the maximum highs forecast for Santiago of 28 C, here it was quite chilly and again over-cast, so that fleeces and jumpers stayed on. 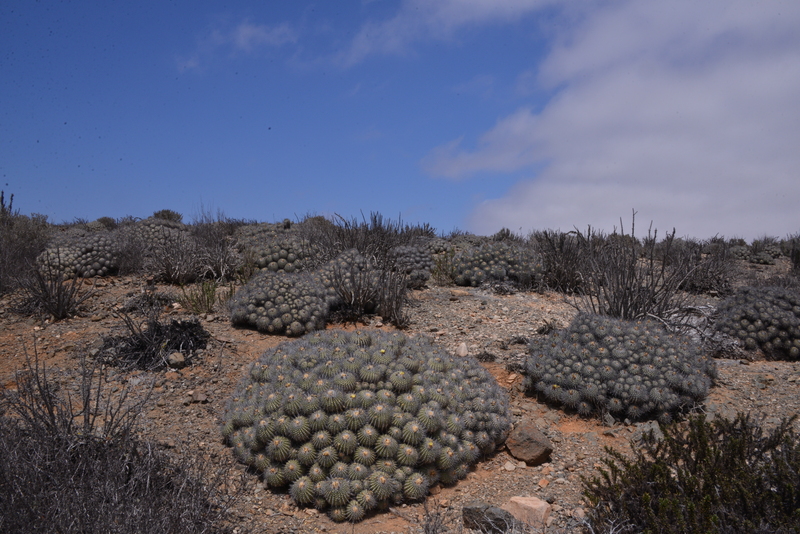 It took a while before we spotted our first cacti – some large clumps of Eulychnia that turned out to be E. breviflora, confirmed by some honey coloured hairy flower buds, away from the roadside (S2854). A bird of prey watched as we took pictures of road signs warning us of cacti and guanaco along the road and of ‘no overtaking’ signs that were followed a 100 m farther along by all clear signs, with absolutely no reason for the short stretch. It seemed as though the road builders had a certain quota of signs to place alongside the road and used their judgement to make it an even spread. To overtake, you need at least two cars, and such occurrences were very few and far between! We made a detour to Baranquilla, as Angie had never been there and had heard me talk about cacti that we had found there on an earlier trip. I miss my little MS Access data base for which I have so far failed to find an Apple McIntosh replacement. I might have to consider putting a Window’s partition on it before the Spring Trip to Mexico. Nearer to Totoral and a bit more inland, we came across some tall, to 20 ft tall, Eulychnia. One bud suggested that this had to be E. acida. These plants were taking a long rest. They were building a large industrial construction, and grafity along the road warned against the Castilliano del Muerto – castles of death. The ever growing economy demands more energy, but no one wants to host the power stations that are a necessary consequence. At least here there was a stretch of desert that seemed to have few people around to complain. We started to see Copiapoa dealbata, many large clumps, and stopped for a much needed leg stretch (S2858). The sun came out and burned back the cloud cover, although it remained chilly. Most of the clumps were in flower, quite a change from the southern population just a few days ago! Eulychnia breviflora was also in bud, with some flowers just opening. Although we have still not found the 2010 stand of C. dealbata where most of the plants were cristate, we did find some impressive crested heads, with one plant with a near 100% of cristate growth gaining our unanimous ‘best in show’ award. We passed the point where a few days ago we had turned round for our return to Vallenar. 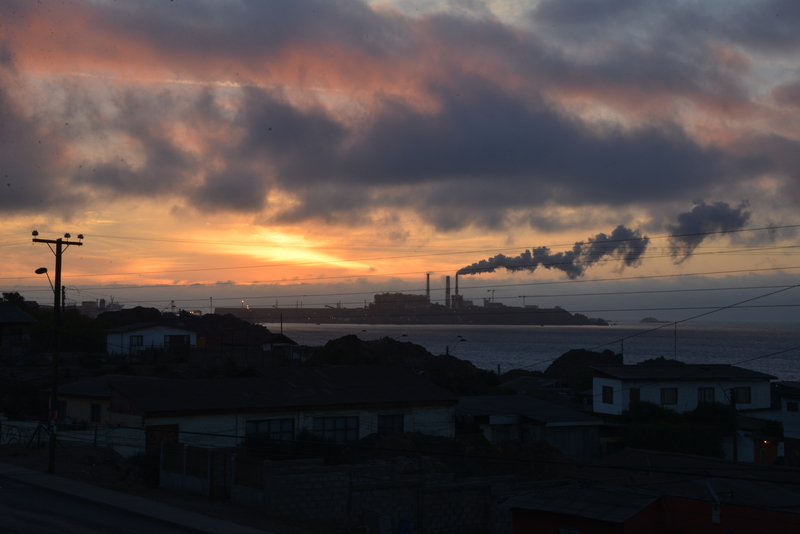 This time we stayed in Huaso, in Hostal San Fernando, with its depressing view over the oil-pellet fired power station belching its smoke, this time over the Ocean rather than over the town of Huasco (S2859), where the population has a much higher incidence of cancer than elsewhere in the country. We’re just staying the one night.